Between Twitch, Instagram Live, and Facebook Live, it seems like everyone’s trying their hand at livestreaming — and Amazon’s new Amazon Live offering proves that they’re no exception. Amazon Live is Amazon’s online, interactive version of QVC or HSN. Hosts demonstrate and discuss Amazon products, from grocery items to consumer electronics. 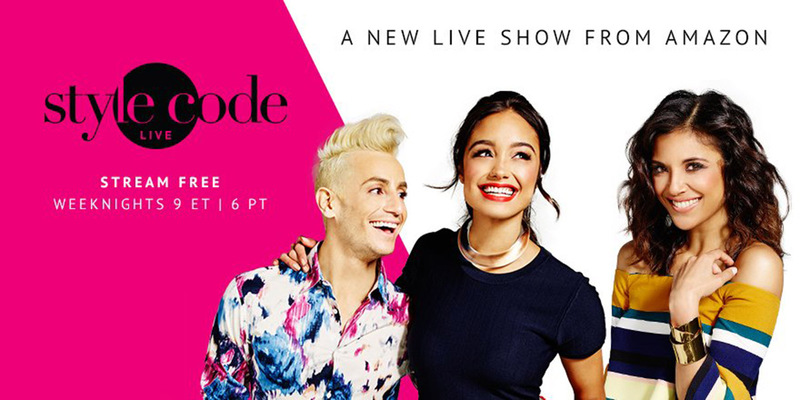 This isn’t Amazon’s first foray into livestreaming — the ecommerce giant previously launched (and retired) Style Code Live (below), a live show dedicated to showcasing fashion and beauty products. But Amazon Live is different: Instead of Amazon employees hosting each segment, brands who want to promote discovery of their products can host their own livestreams through an app called Amazon Live Creator. Underneath each video, shoppers can view and buy the products discussed, ask questions, and chat with the hosts. Why livestream with Amazon Live? With the livestreaming feature being so new, it’s hard to say for sure how it will (or won’t) help brands sell more on Amazon. The app is not yet listed in Amazon’s main navigation — you have to have the URL (amazon.com/live) on hand to access it on desktop. On Amazon’s mobile app, there’s a new section labeled “Amazon Live” that lets users see any current livestreams. Who can livestream with Amazon Live? Any US Professional Seller registered with the Amazon Brand Registry can livestream through Amazon Live. Livestreaming from China or Hong Kong is not currently supported. That said, you need an iOS device to download the Amazon Creator Live mobile app, which is currently required to stream on Amazon Live. To create livestream on Amazon Live, you need to download the Amazon Live Creator mobile app. Once you download the app, you can log in with the email address tied to your Amazon Seller Central account. Then you’ll select the products you want to feature in your livestream. You can schedule your livestream for a future date and time or go live instantly from the app. Livestreams can be filmed either through your iPhone camera or, if you’d prefer to use a professional camera, through an encoder. You can stream your video content on Amazon’s desktop and mobile sites, as well as their mobile app. While Amazon Live represents a new concept in the US ecommerce market, livestreaming has been popular (and profitable) with Chinese ecommerce platforms for several years. Hangzhou-headquartered ecommerce platform Taobao leads the pack in popularizing livestreaming: 23 stores on Taobao achieved $15 million or more through livestreams alone in 2018. Building off of this success, Taobao recently launched a standalone ecommerce livestreaming app. Taobao hosts tens of thousands of livestreams every day, covering categories from clothing and jewelry to agriculture. Like YouTube and Instagram, Taobao’s livestreaming has its own set of influencers: Over 2,200 streamers have more than 500,000 followers each. These influencers stream frequently and for an average of 8 hours at a time, a marked difference from the 10 minute live infomercials on Amazon’s platform. Will Amazon Live attract the same level of influencer involvement and dedicated viewership? Only time will tell, but it’s clear that the model has seen success overseas, and that Amazon wants to follow Taobao’s lead in creating an interactive livestreaming experience for shoppers — whatever that may look like.